John McVay founded a surveying firm in 1973 and over the past 30 plus years the firm has matured and evolved into the innovative engineering, surveying and planning firm ECON is today. As CEO, Mr. McVay is responsible for the oversight of ECON’s operations and works closely with the President to ensure ECON’s standards of excellence are met at every level of a project. 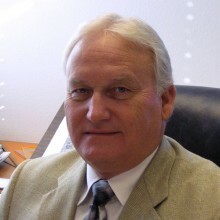 Mr. McVay has over four decades of experience and thirty five years as a partner and business manager. He is an accomplished executive with a history of success leading strategic efforts and projects at the local, regional and international level. In addition, Mr. McVay has extensive knowledge in marketing, strategic planning, surveying, construction layout, supervision, zoning presentations, land planning, design and governmental permitting. Mr. McVay is a licensed Professional Surveyor & Mapper (License #4003) as well as a Registered Real Estate Broker in the State of Florida.